A lot of cookbooks cross my desk, many of them from restaurants I've never heard of until I open the book. 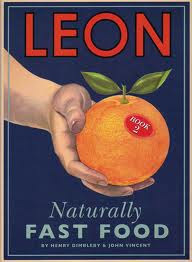 That was the case with a very hyperactive book called "Leon: Naturally Fast Food," by Henry Dimbleby and John Vincent of the London-based restaurant chain Leon. Flipping through all the pictures and drawings and quirky lists, though, I found a lot that lives up to the promise of the title: Fast ideas for quick meals, mostly in the healthful vein. One recipe that caught my eye was for a green herb sauce that would be just the thing in the late summer. It's very adaptable: change out the herbs for basil or tarragon or whatever you have around. Serve it on grilled meat or oven-roasted fish, spoon it over vegetables, use it as a salad dressing, or spread it on a sandwich. While you use it, you could ponder who Leon was. I went all though the book trying to answer that question and never quite figured it out. From "Leon: Naturally6 Fast Food," by Henry Dimbleby and John Vincent (Conran/Octopus, $29.99). Put all the ingredients in a blender and process until smooth. It should be runny but substantial. Transfer to a sealable jar and refrigerate. Yield: About 1 1/2 cups.